Pizza lovers know all about all the different kinds of cheeses and toppings you can put on pizza for infinite variety from savory to sweet. 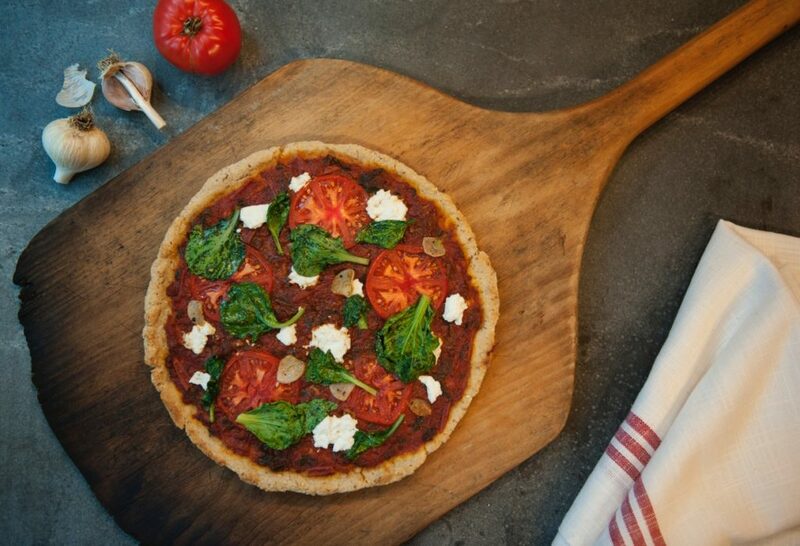 Hot out of the oven, this gluten-free pizza crust topped with a combination of homemade tomato sauce, fresh sliced tomatoes, chevre, sauteed garlic and greens is a work of art. Feel free to swap other favorite seasonal organic vegetables and pastured raised organic cheeses such as sauteed eggplant and extra sharp cheddar cheese. Best of all, this is the most delicious pizza crust I have ever made. The combination of teff and millet flour gives it a subtle sweetness. 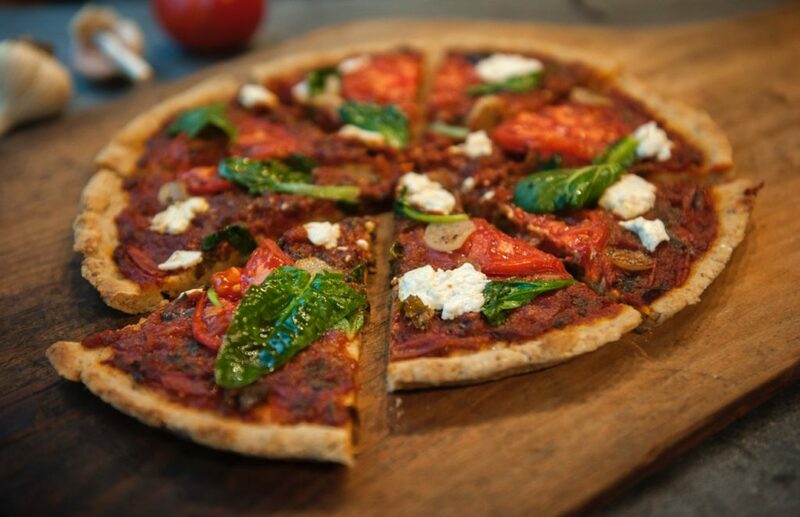 Pour yourself a glass of wine and enjoy a hearty, gourmet meal of vegetarian pizza with chevre and greens. Combine water and yeast in a medium sized mixing bowl. Set aside yeast mixture while combining teff flour, millet flour, potato starch, tapioca starch, oat bran, psyllium husks powder, golden flax seed meal, arrowroot starch, and kosher salt into a medium sized mixing bowl. Add the honey, oil and yogurt to the water and yeast. Then pour those wet ingredients into the bowl with dry ingredients. Use a spatula to combine batter. Stir vigorously for two minutes or until batter comes together and track marks are visible. Cover bowl with loose plastic wrap or towel. Let rest for 30 minutes in a warm area. Voila! It looks like a pizza dough. To form the pizza crust: lightly oil, or sprinkle cornmeal on a sheet pan, round cast iron pan or a pizza pan. Use a small amount of olive oil on your hands when handling dough. Separate dough into two balls and gently press into a thin pizza crust. Each crust should be about 10” round and about 1/8” to 1/4” inch thick. Bake crust without any toppings for about 10 minutes. While the crust is baking, make the toppings. Heat the olive oil in a large saucepan over medium heat. Add the garlic, salt and pepper and saute for 2 minutes, until fragrant and garlic is golden. Stir in the greens and saute for 1-2 minutes until they turn bright green. Turn off the heat. Remove the pizza crusts from oven. Spread 1 cup of tomato sauce over each pizza crust. Top each pizza with half the sliced tomatoes. Then add and decorate the pizzas with the greens and chevre. Bake for about 5 minutes; until chevre softens. Turn off the oven. Remove the pizzas, slice and serve. Pizza Topping Recipe Copyright © 2017 Leslie Cerier. All Rights Reserved to Leslie Cerier. This entry was posted in Blog, Gluten-Free, Main Dishes, Recipes, Vegetarian and tagged ancient grain, ancient grains, Chevre, gluten free pizza crust, gluten-free pizza, leslie cerier, Main Dish, pizza, recipe developer, superfood, superfoods, Teff, teff flour, teff pizza, tomato, whole grain, Whole Grains on 12/04/2017 by Leslie Cerier.